Many of us have been waiting years upon years to see Brandt Peters‘ character Inkslinger in 3D form, and with Tuesday’s news, we will finally see this fella in the Wandering Misfits mini series! Before this sought after figure becomes available, you can have him adorning your wall with the awesome print “Inkslinger’s Dream“. This print from several years back features the almighty tattoo loving Inkslinger and a couple mischievous Skelves filling his head. This signed and numbered archival print is a low run of only 20 (There may only be 1 or 2 left in the store) and is 24×12.5 inches for $125. Pick it up right here in the CP Store! 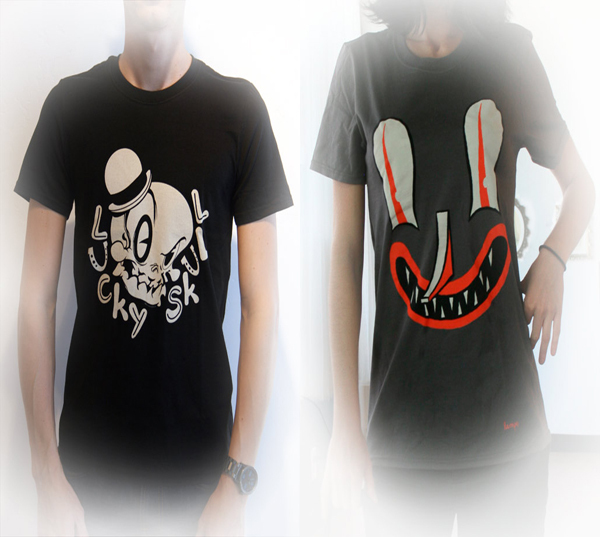 Circus Posterus shirts in stock! While you’re updating your wardrobe with fancy new DrilOne shirts, we thought we’d remind you that we have some wonderful Circus Posterus shirts in stock in our store as well! 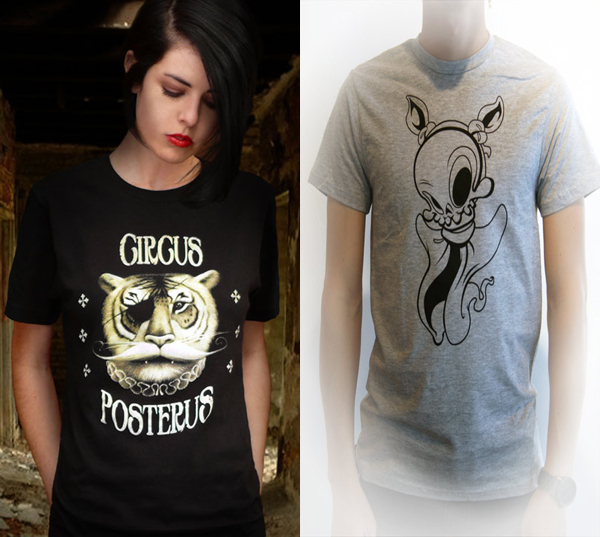 On the left, we have Travis Louie’s one eyed tiger emblazoned on a shirt – wear your love for Circus Posterus on your sleeve! Or chest, which is more visible anyway. On the right, is a shirt featuring our favourite Boo Skelve. The shirt on the left features the Brandt Peters classic Lucky Skull. We can’t guarantee that wearing this shirt will make you luckier, but it will probably make you better looking. On the right, we have a Travis Lampe Smoggy design, which is certainly going to be very flattering. Our friend Carlos East made this video about Stranger Factory, and we think it’s simply fantastic. Together with his brother Ernesto, Carlos is part of the formidable Beast Brothers – toy sculptors, painters, video mavens – they’re really a pair of amazing multidisciplinary artists. 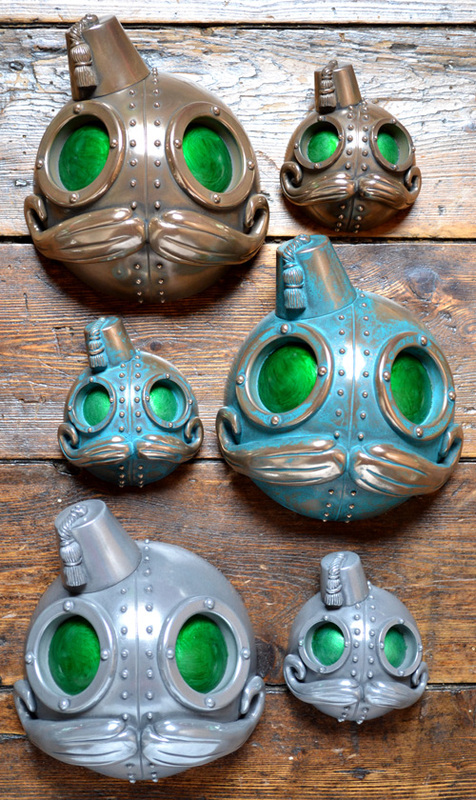 Take a look inside our little store of wonders, and listen to Brandt talk about Stranger Factory! 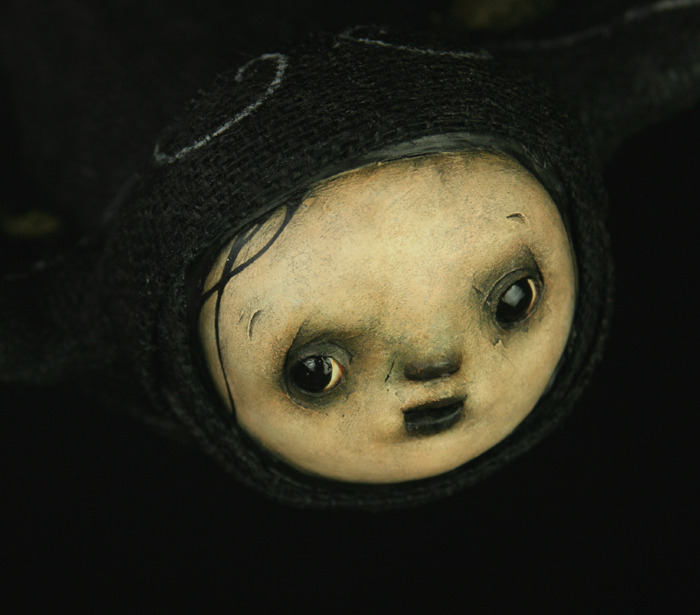 It’s the essence of Stranger Factory in just over 3 minutes and it’ll be well worth your time. 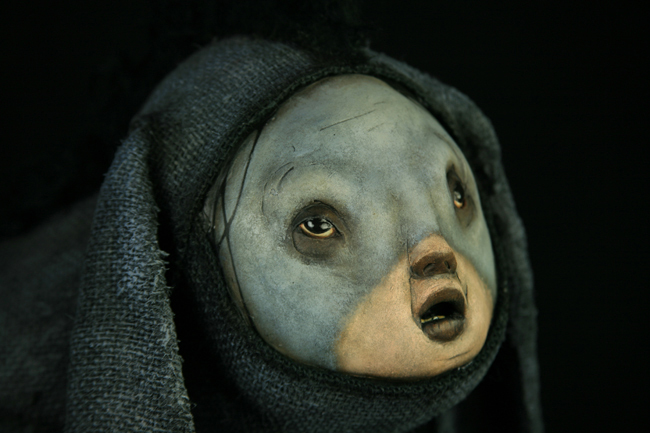 STRANGERFACTORY from The Beast Brothers on Vimeo. Check out more awesome videos about art and other artists by the Beast Brothers, on Vimeo (BEAST.V.). 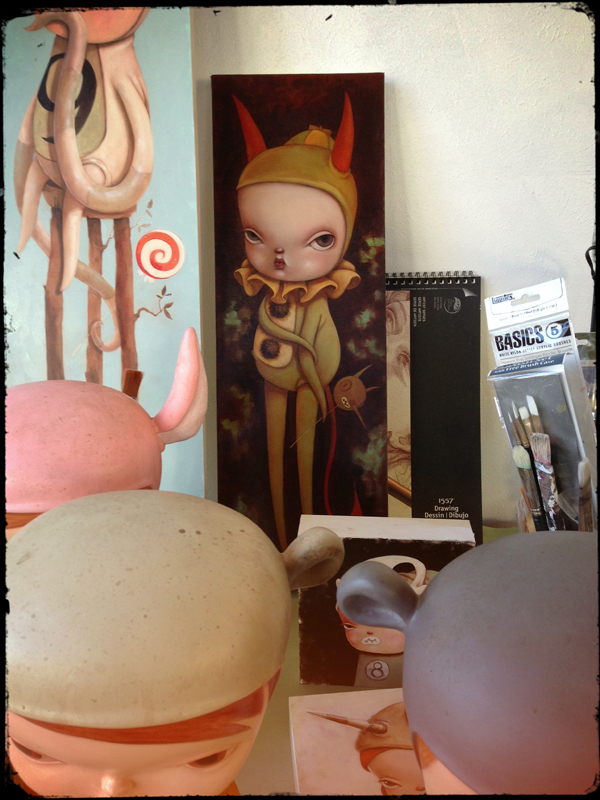 Earlier in the week, we had a nice look at several pieces Kathie Olivas is working on for “Scout” at Stranger Factory this April. In that image, we saw a partial view of another painting she is working on – and now we get to see all of No. 8! Classic Olivas character here – No. 8 is very disgruntled, with a sullen expression and discontented eyes. Fortunately, she can hide behind the ever ready Skelve mask. I’m sure this misfit will be good to go by April. Look for No. 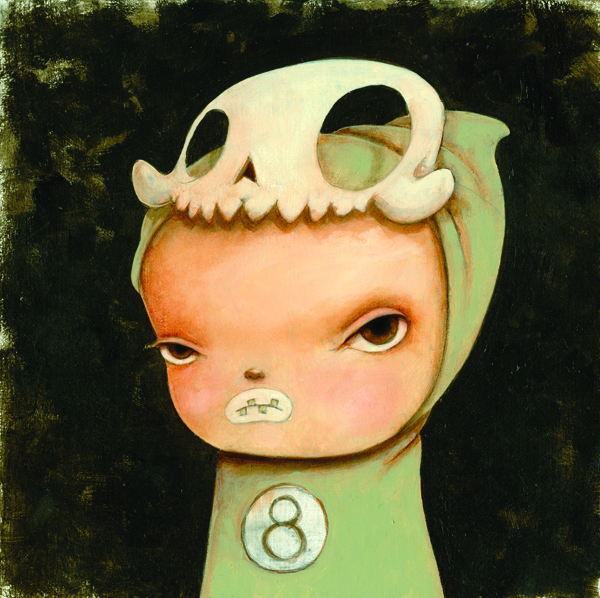 8 and more from Kathie Olivas‘ “Scout” April 5th at Stranger Factory along with Scott Radke’s “Interface”, and Stephan Webb’s “Evolutionary End Game”. An opening reception will occur April 5th from 6-9pm. There is something mesmerizing about a shadowed image. When we sought an image for Stephan Webb’s EVOLUTIONARY END GAME, we were graced with this scintillating piece of design. The image itself creates a challenging aesthetic and cognitive experience when coupled with the title of his show. Evolution can be excruciatingly slow, but it seems Stephan has adapted his work for this show to display that it can be in our hands. 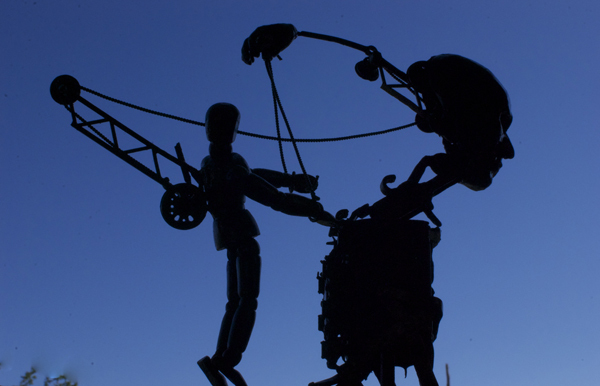 The image portrays a man building or puppeteering another man, and how we are accelerating to new heights quicker than ever before. 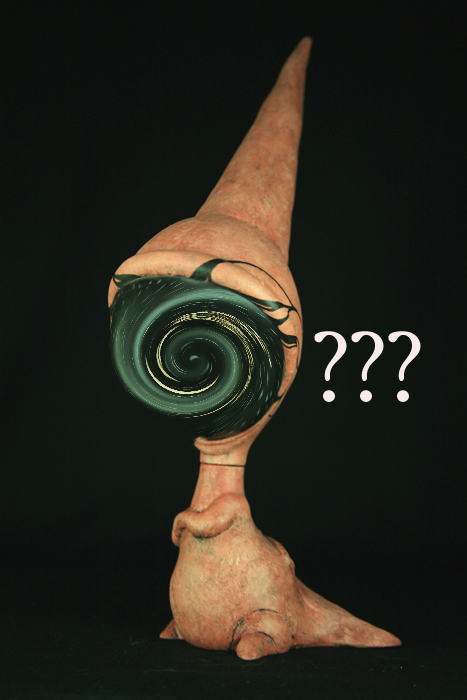 We can’t be certain until the full reveal later in the month(although we are pretty certain), but his sculptures we have seen for the exhibit are proving to be simply astounding and full of layered meaning. We also got a chance to talk to Stephan about his work, which was pretty worth it for the bad pun alone. 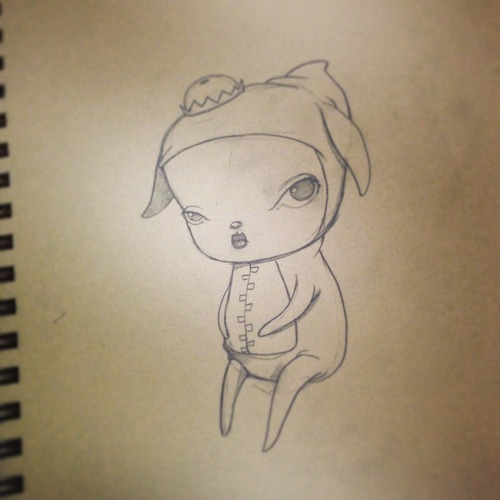 CP: Tell us about your art! WEBB: My art is so metal! No, literally. It’s metal. CP: Why have you chosen bronze as your medium? 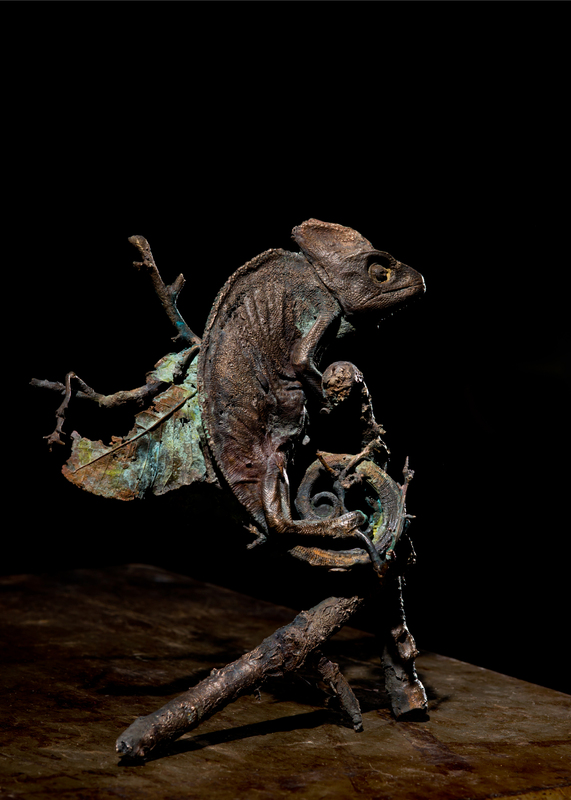 WEBB: I was always intrigued by bronze and metal casting, but it wasn’t until I took a bronze casting class that I completely fell in love with bronze. I love that someone can take a completely raw material and essentially create something from nothing. Also, it lasts thousands of years. That’s kinda cool. CP: You also have a biology degree right? It’s a clear influence on your art – but which came first – art or biology? Yes, I do. Art and science have always gone hand in hand for me. When I was 6, my favorite book was A Natural History of Dinosaurs. I would draw the dinosaurs, memorize their names and then try to describe the theory of continental drift to my classmates. Didn’t go over so well. My teachers thought I made the whole thing up. CP: Do you consider living in Albuquerque an influence on your art? If so, how? WEBB: Less of an influence, more of a convenience. One of the biggest suppliers for casting materials and tools in the country is located right here in Albuquerque. Really convenient when you run out of something in the middle of working. CP: What can we expect to see from you from this upcoming show at Stranger Factory? WEBB: Evolutionary End Game is going to be more organic and less mechanical than most of my work. This series deals with some evolutionary concepts such as transitional species and “missing links.” I like the idea that our knowledge of extinct organisms is derived from what is found in the fossil record. What about the creatures that left no evidence of their existence? The possibilities are endless. Stephan Webb’s “Evolutionary End Game” opens April 5th at Stranger Factory along with Scott Radke’s “Interface”, and Kathie Olivas‘ “Scout ”. An opening reception will occur April 5th from 6-9pm. What does Scott Radke have in store for “Interface“? Is this a dinosaur, an elf, or gnome…or something else from the realm of Radke? We added some swirly, twirly, icing to the image to help keep a little secret, but whatever it is, it seems like there may be a few of them migrating to New Mexico in April! Keep checking the Circus Posterus blog because we will have the full reveal soon! More and more updates for the Brandt Peters and Kathie Olivas‘ Wandering Misfits Blind Box mini-series by Cardboard Spaceship are turning up! 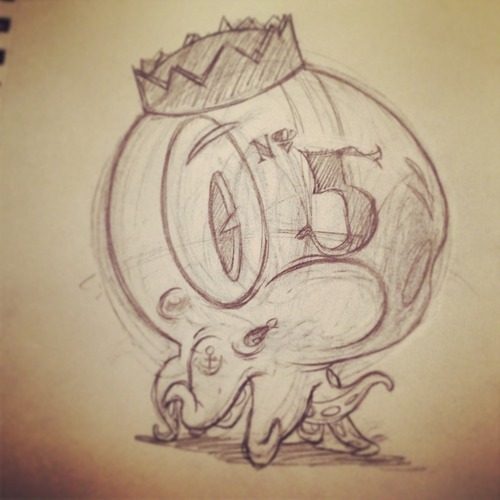 This time, the Circus Posterus Tumblr showed us Calliope and the final Wandering Misfits reveal – Inkslinger #5. Finally, Inkslinger has a production version of his bad self! With this tiny floppy eared girl, and the tattoo loving cephalopod, the series total is now at 11 figures, including: Devil Boy, Heathen Snake Skelve, The Greeter Skelve, Kuma Skelve, Elizabeth in Bear Suit, Inkslinger, Boo Skelve, Bat Boy, 4-legged Masao Skelve, Calliope, and Skelve Pull Toy. The series will be based on Brandt and Kathie’s familiar characters, the Wandering Misfits. The sculpting is done by a familiar face that Circus Posterus have collaborated with before, Scott Wetterschneider of Shinbone Creative. We are stoked to see the full 3d versions soon! There is always something profoundly refreshing about seeing an artist’s studio and work bench – it’s like a small glimpse into their world! We are lucky enough to have artists that openly share these images, and we couldn’t be more thankful. Now, this brings us to the good stuff because Kathie Olivas has done just that. There is so much going on in this image! We don’t see much of the Elizabeth sculpts at the bottom, but luckily we get a good eyeful of the paintings. Kathie’s long canvas pieces have always been my favorites, and it looks like we will definitely get some for “Scout“. Devil horns, tentacle-like appendages, ruffles, tails, and a devil toy on a classic Olivas’ figure? OH MY! And to the left, what is on this even longer canvas, but a No. 9 sweet tooth figure sitting on a tree stemmed stool? We can’t forget the smaller works below either because it looks like No.8 is reminiscent of one of Kathie’s Scavengers, and sporting a Skelve mask. And there’s a little lady with narwhal headgear peeking out below. Only a few more weeks until the opening, but until then we are anxiously waiting for more images and news. Scott Radke is certainly known for his glorious burlap and clay renditions of animals, humans and other hauntingly delicate and earthy things. But the crowning glory of his work – the element that leaps out and keeps you looking(or unable to tear your eyes away) – are the beautiful and poignantly expressive faces on his sculpts. The faces Scott Radke creates are alternately sorrowful, longing, coy, anxious, or an indeterminate mix of all – or none – of the above. In fact, the faces his burlap minions wear may even change, almost imperceptibly, based on how the light hits, the angle. of viewing…and maybe just how you’re feeling that day. We can’t wait to show you more from Radke’s stellar show in April(but we will). Check back often to see what this wizard has up his sleeve! Scott Radke’s INTERFACE opens at Stranger Factory on April 5th, 2013. Ooooh! Doktor A just showed off some pictures of his new product, a series of cold cast metal Mechtorian wall plaques! 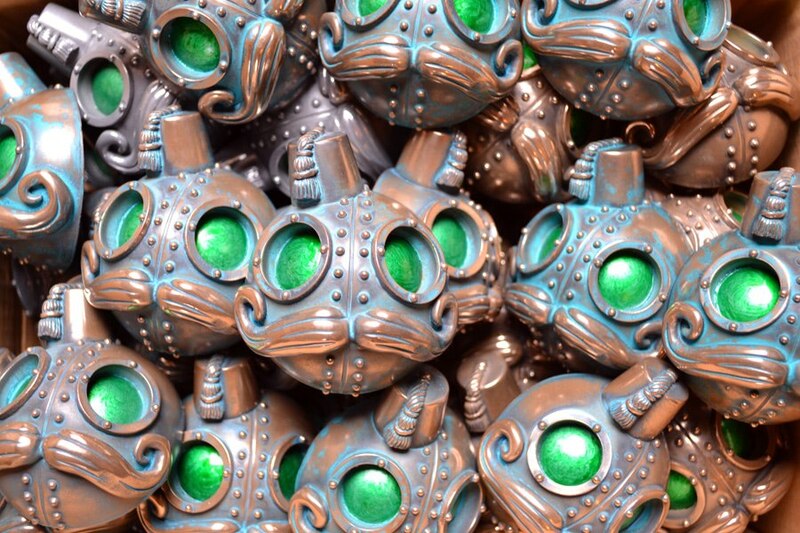 These shiny gentlemen heads are known as “Phizogs” and will be debuting at Toycon UK in a couple of weeks, for those lucky enough to make it! These beauties are an open edition, which is good news for those of us clamoring to own a piece of the good Doktor’s work. 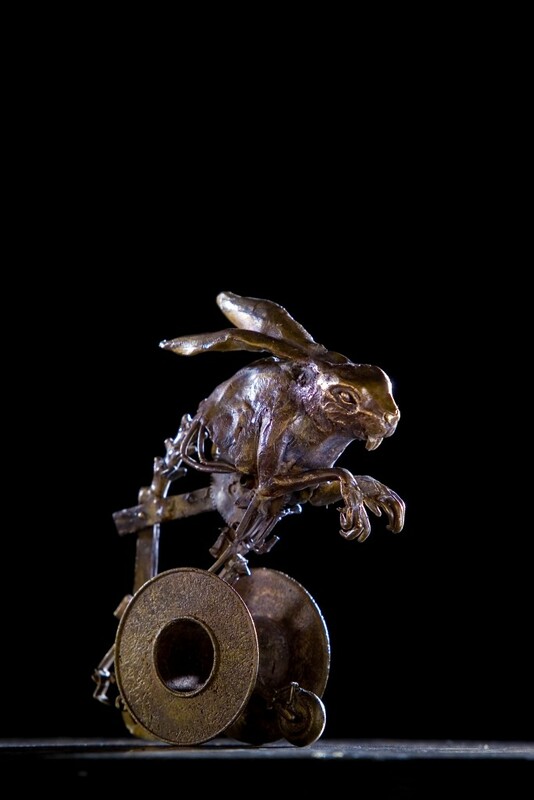 They are all hand finished and signed by Doktor A and will be coming in three finishes : Brass, Pewter and Verdigris. They will come in a “Mini” version, which are 3″ across, as well as a larger “Midi” version, which are approximately 5″. The colour schemes seems to align nicely with his Humphrey Mooncalf, and we have the “Dapper” colourway in stock now. It’s going to be a big year for Doktor A and Circus Posterus – we’ll be seeing him in May at Stranger Factory in a two person show with Chet Zar called ODDFELLOWS. He’ll also be returning to participate in Monsters and Misfits III in Japan this September! We’ll have more news on both shows coming soon!